The problems that took the Rifftides computer out of action a few days ago were resolved when I replaced it with a newer model. Then, attempts to post new items derailed in an onslaught of password problems involving the publishing platform. That has been fixed, too——I think. Perhaps any computer owner will understand my lingering skepticism. 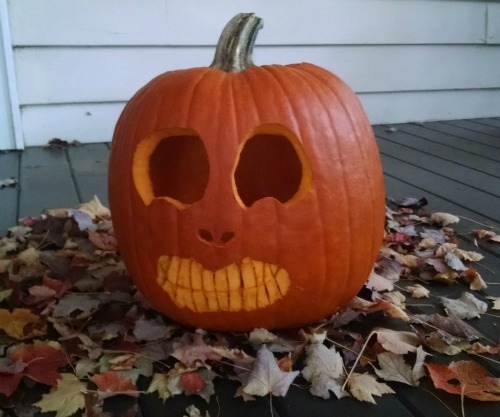 Had it been possible to post yesterday, I would have wished you a happy Halloween and shown you the official 2015 Rifftides Jack O’lantern. Here it is, a day late, nestled in a bed of fallen maple leaves on the porch. We had 67 trick-or-treaters last night, including a repulsive monster dripping blood and an enchanting princess who touched us on the shoulder with her wand. Jessica Williams is a wonderful talent, woefully under-recognized. I’ve had the opportunity to hear and record her on several occasions, and have marvelled at her range and depth. Thanks for the update, Doug: it’s good to know she’s getting back on track with her career. I’ve been fortunate to hear Ms. Williams play an intimate house concert as well as many of her remarkably beautiful recordings. Its good to learn she has been treated successfully for debilitating and painful conditions that have plagued her for years. Recorded or live, I look forward to more of her wonderful music. I’m elated to hear that Ms. Williams is back on the scene. She’s certainly one of the most underrated pianists ever. The west coast is a long way to travel, but I’d love to hear her in person. I guess that, instead, I will have to listen to her rather prolific recordings such as Live At Yoshi’s with the great bassist Ray Drummond and drummer Victor Lewis.